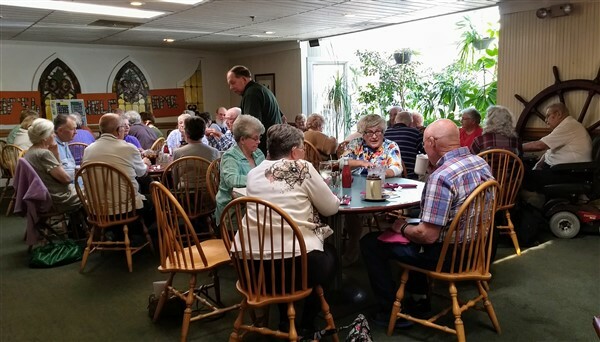 Welcome to the Ludington High School Class of 1956 Web Site | Keeping track of the Class of "56"
Keeping track of the Class of "56"
The next class of “56” Breakfast is scheduled for the Big Boy in Ludington on Tuesday May 15, 2019. 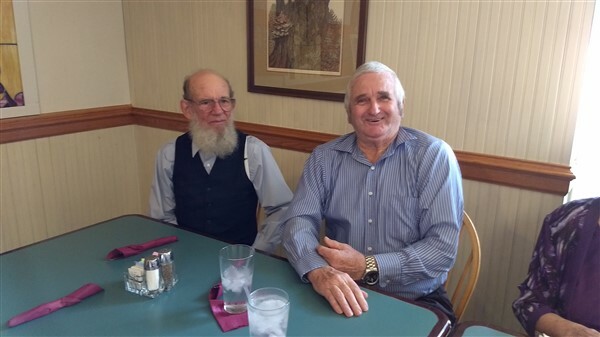 Recently John Nyuli reported that he had lunch with Tom Hall in Chicago. 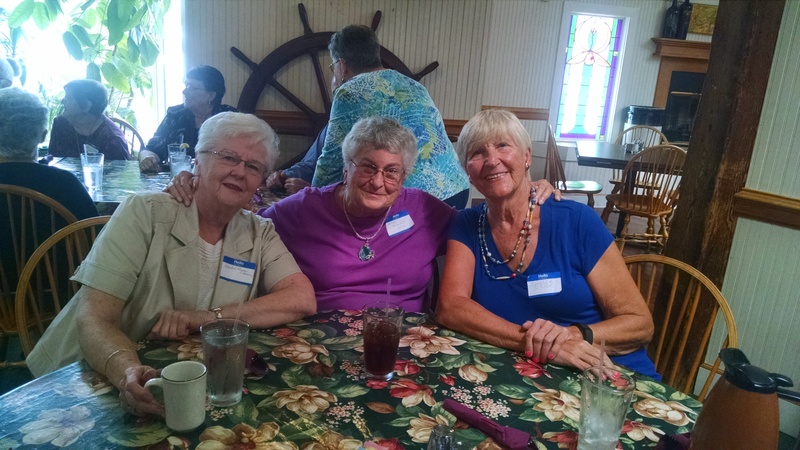 A reunion of sorts for old high school buddies. John says he plays lots of golf. You are lookin’ good Doctor John. Hope to see you at breakfast sometime! 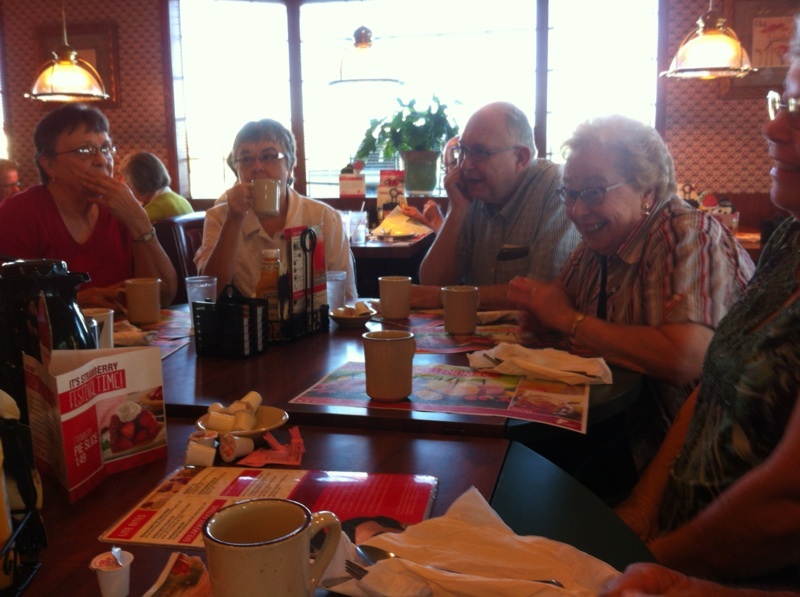 The Big Boy breakfast group on Tuesday July 17 is pictured below. It was the start of a great summer day in Ludington! We are sad to report that classmate Arlene McCumber Nelson Marston passed away on July 8, 2018. She was born April 5, 1938 in Ludington to Bill and Irene (Moline) McCumber. 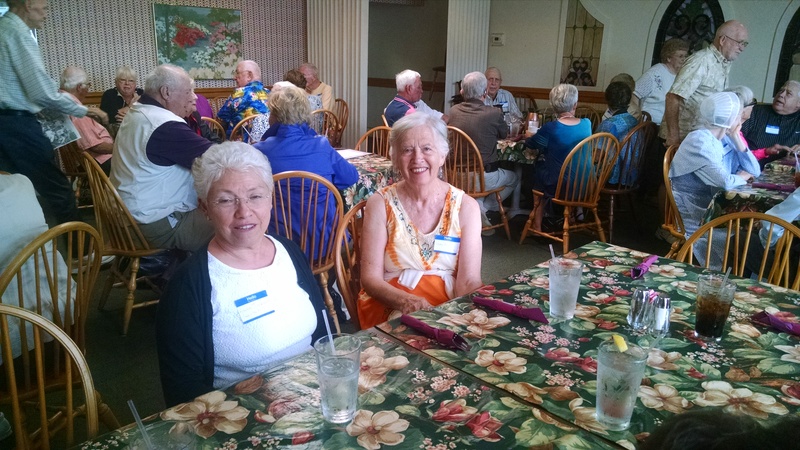 Arlene graduated from Ludington High School in 1956. She married Hurley Nelson in 1956. Together they had four children. After his passing in 1988, Arlene married David Marston on Jan. 27, 1989. Arlene loved traveling with David in their motor home. She especially enjoyed wintering in Florida and Mississippi. She enjoyed the slots at the casino and swimming whenever she had the chance. 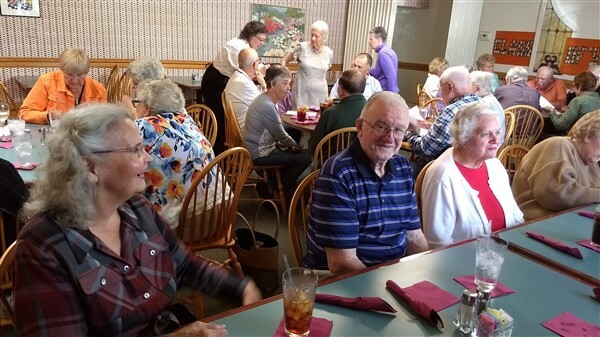 Arlene will be greatly missed by her husband, David Marston; her children, Cindy (Mark) Hamilton, Chris (Nui) Nelson, Cathy (Mike) Gunberg, and Cheri (Mark) Staley; her stepchildren, David, Keith, Kevin, and Becky Marston; numerous grandchildren, great-grandchildren, and great-great-grandchildren; and her brothers, Jim (Yvonne) McCumber and Mike McCumber. Besides her parents, Arlene was preceded in death her first husband, Hurley Nelson, and granddaughter, Amanda Gunberg. Tuesday, May 15 started as a rainy early morning, but it turned out to be a really great day! 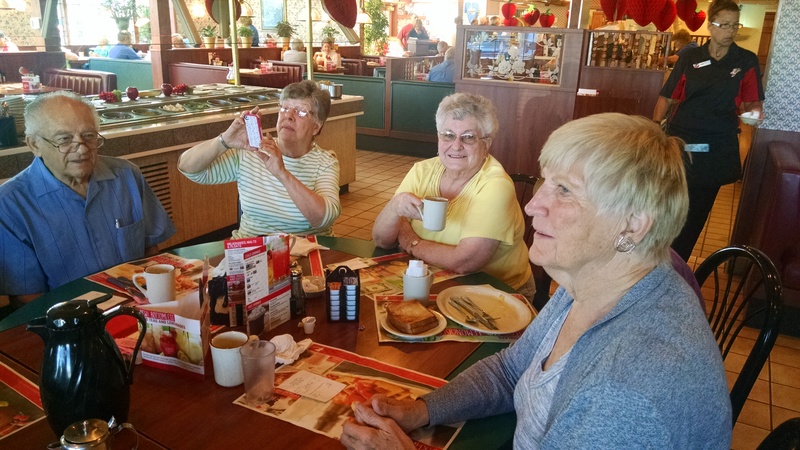 Breakfast at the Big Boy in Ludington was quite entertaining and held a very pleasant surprise! 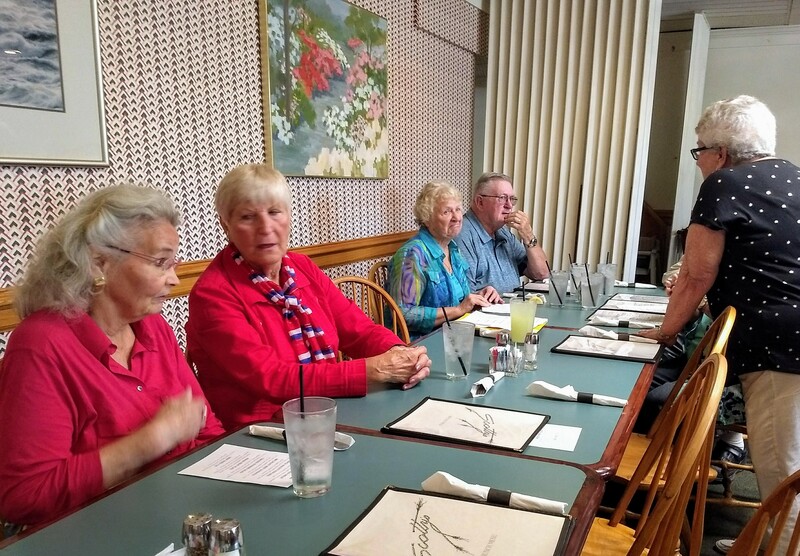 Here is a picture of the lively group. The surprise is that two of our classmates have become an “item” . Our lips are sealed in the name of privacy. This is exciting news! We’re looking forward to the next chapter in this adventure! 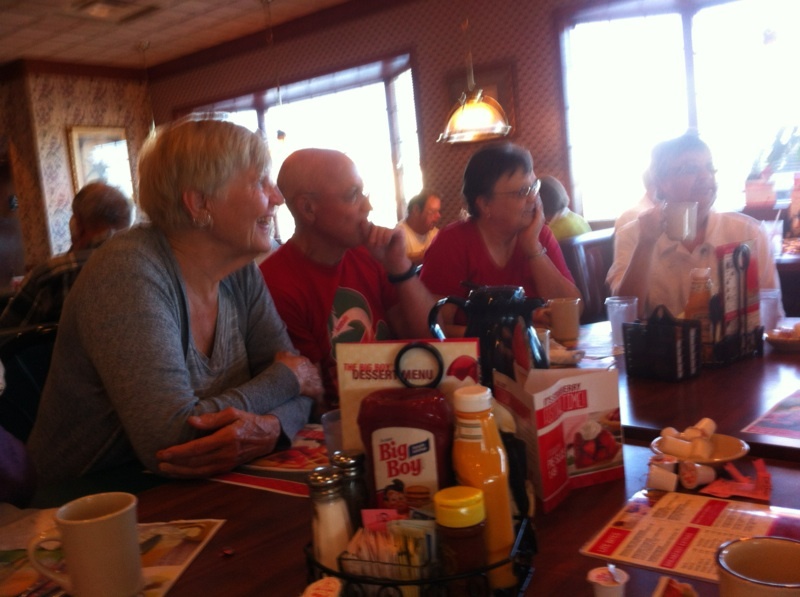 Maybe you should plan on being at the July breakfast and catch up on what your classmates are up to! We are sorry to report a classmate’s passing on April 22, 2018. Carol Dewyer went to be with her Lord and Savior on Sunday, April 22nd after a courageous three month battle with cancer. Carol Fern Dewyer was born November 11th, 1937 in Ludington, where she lived her entire life. She grew up with four brothers and three sisters and is survived by her sister Margorie Dewyer and brother John Dewyer, both of Ludington along with brothers Tom Dewyer and Ray Dewyer both of Tucson Az. She was preceded in death by her parents, Emma Marie (Roberts) and Leo Charles Dewyer and sisters Marion Nephew and Lois Setterbo and one brother, Robert Dewyer. Carol was the baby of four girls and had fond memories of family picnics, trips to the beach and Sunday drives. 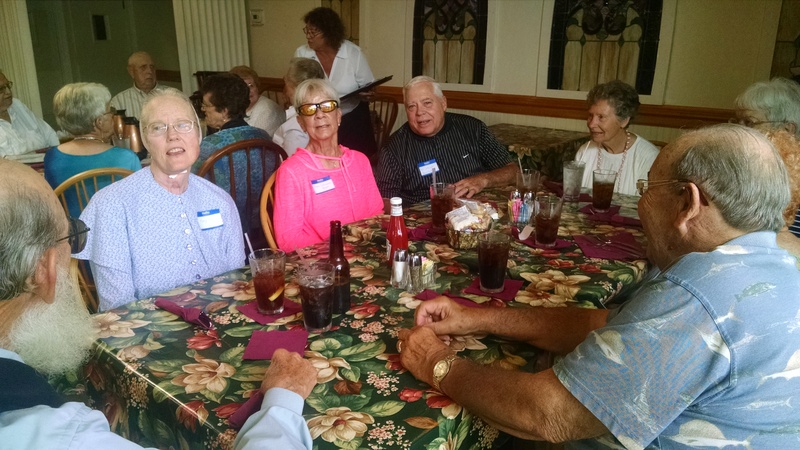 An LHS graduate of 1956, Carol enjoyed many years of playing sports, especially rec. softball. After High School, she spent three years studying under established writer, Mary Frances Donor. 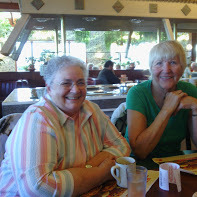 Her time with Mary was well spent and much enjoyed as Carol had several of her short stories published in various magazines. Carol loved gardening and raising plants of all sorts. Following graduation, she worked at P.M. Floral and attended the Sixth St. greenhouses. For over 25 years, Carol raised an impressive vegetable garden along with blooming plants and a variety of flowers. 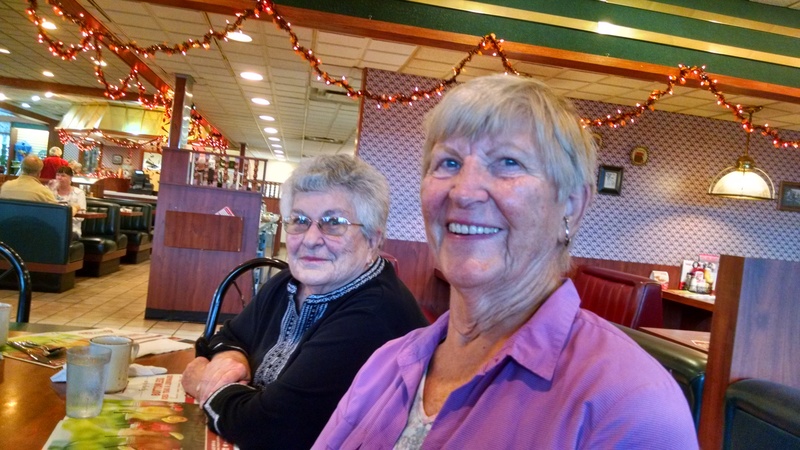 She worked for Floral Craft of Ludington for over 21 years, retiring in 1997. 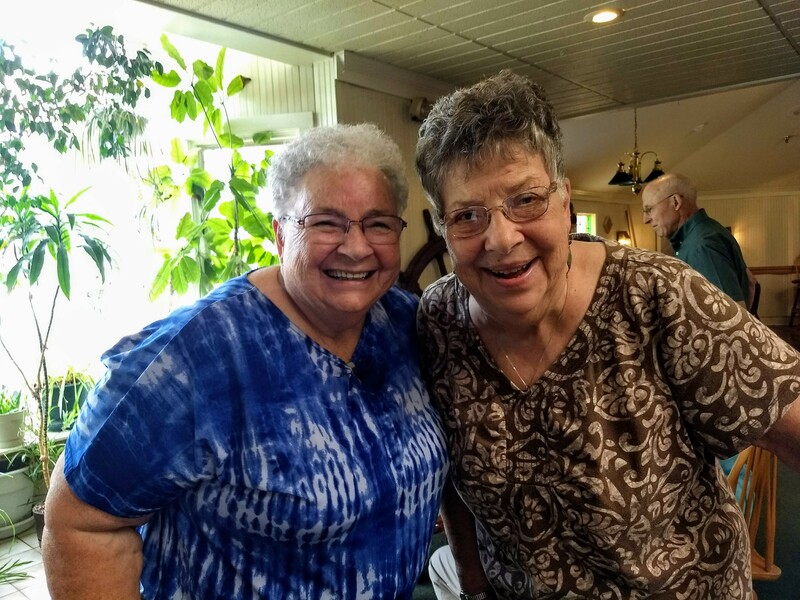 You are invited to a celebration of Life for Carol Dewyer on Saturday, May 12th, 2018 beginning at 11:00 am, with visitation beginning at 10:00 am. at Bethany Lutheran Church, 1101 S. Madison St., Ludington with the Reverend William Huether officiating. Calling all Classmates! Carol Dewyer is in desperate need of cards and letters. 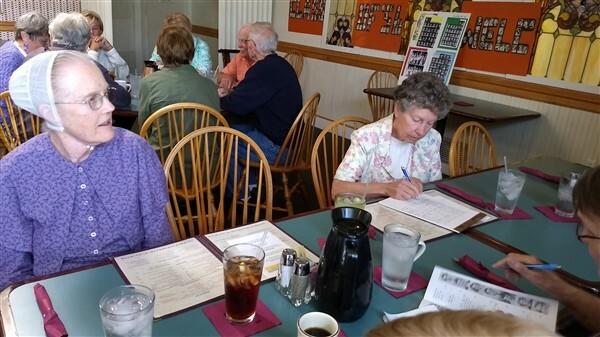 Carol is very ill and is currently at Medi-Lodge of Ludington (Used to be Tendercare of Ludington). If you are in the Ludington area, stop in for a visit. You will then be excused from sending a letter, but a card would still help. 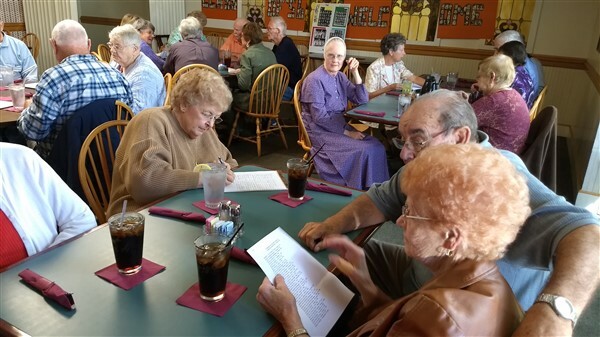 Carol does not have any electronic devices that allow email or other communication, so this is your opportunity to exercise some long forgotten penmanship and refresh your memory of socializing before Facebook, Twitter and Instagram existed. Send your greetings today! And thanks for cheering on a classmate! The first day of spring is upon us. It has been a long, snowy winter, but the sun is beginning to shine in more meaningful bursts of warm. Donald C. Braley, age 79, of Ludington passed away Wednesday, Jan. 17, 2018. Don was born April 13, 1938 in Muskegon to Donald Chase and Dorothy (Kline) Braley. 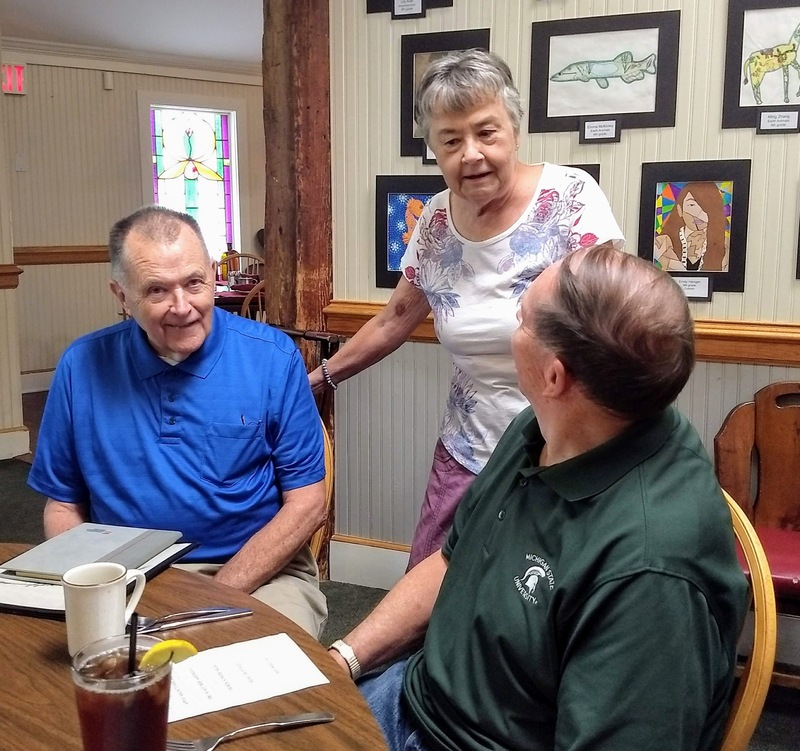 He lived in Reed City and Scottville as a child attending Mason County Central Schools through the third grade, moving to Ludington in 1948 where he grew up, attending Longfellow School and graduating from Ludington High School in 1956. Don served two years of military service with the U.S. Army in the 2nd Division, 7th Cavalry at Fort Benning, Georgia. 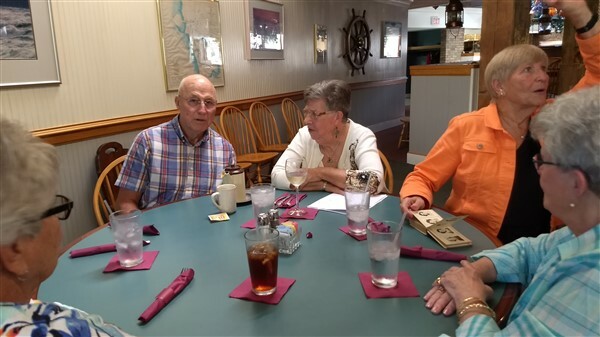 He was employed by Ludington State Bank, Ludington Bank and Trust Co. and then Old Kent Bank for 39 years before retiring from Old Kent Bank in 1998 as Senior Vice President. He was a past master and secretary of Pere Marquette Lodge No. 299 Free and Accepted Masons. 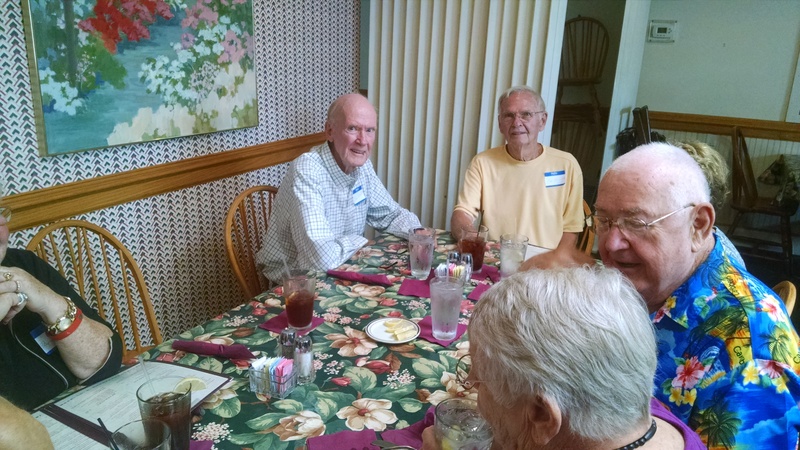 He previously served as manager of the Masonic Temple Association. 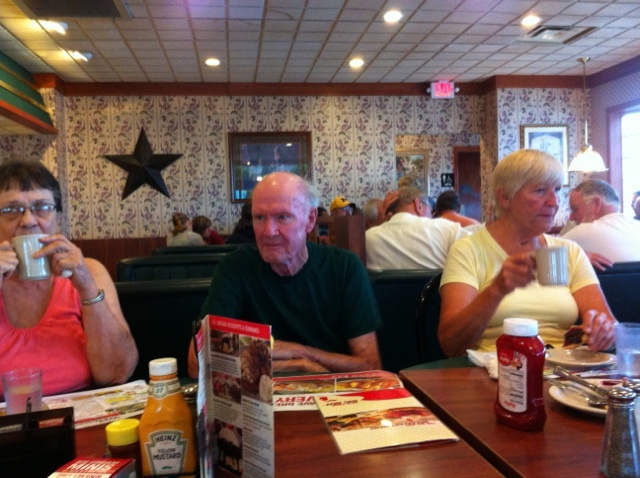 Don was also a member of the NRA and the American Legion Post 76. 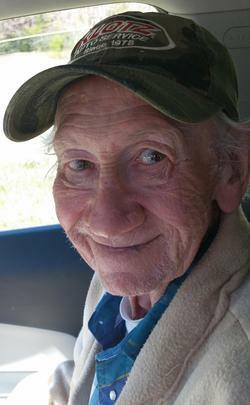 He enjoyed his grandchildren, hunting, fishing, gardening, the outdoors in general and a special place called the “Beaver Pond” in Michigan’s Upper Peninsula. Don is survived by his wife, Nancy L. (Hodge) Braley; children, JoLynn M. Braley, Jeffrey D. (Kelly) Braley and Carole A. (William J.) Lenzo; and grandchildren, Ryan Braley, Andrew, Carter and Ethan Lenzo. Our classmate, Karen Cloutier, age 79, passed away quietly at the home of her daughter with her family by her side on December 29, 2017. Karen was born on September 21, 1938 to John and Rose Johnson in Ludington, Michigan. 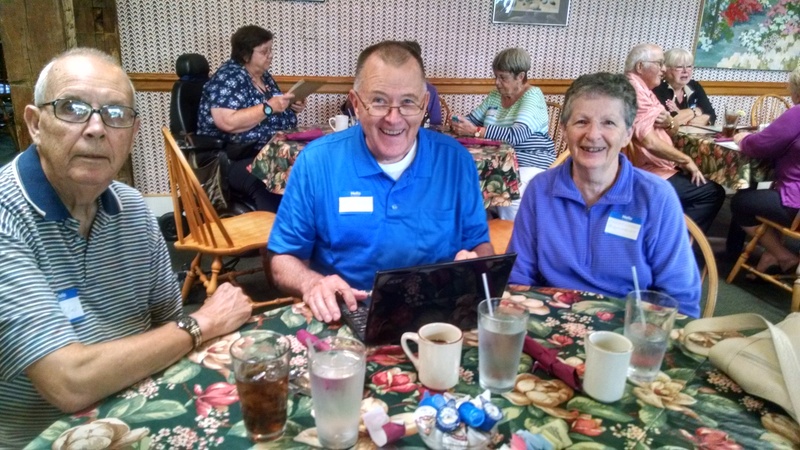 Karen worked as a Certified Nurse Aid at Heartland Manor for more than 20 years, retiring at the age of 70. 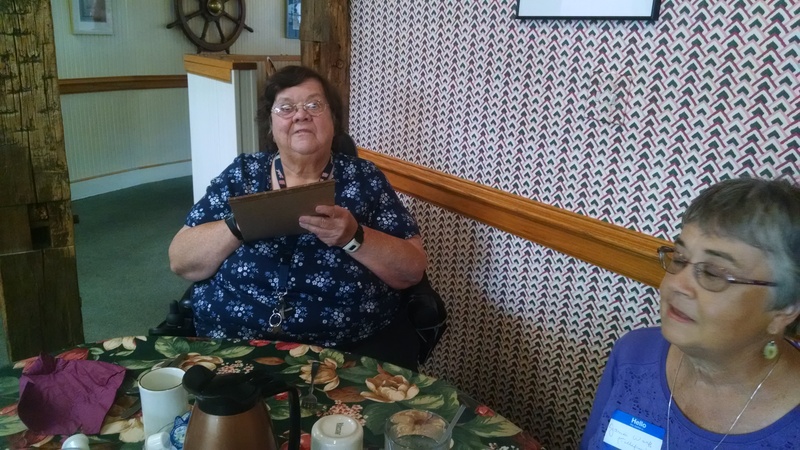 Karen was a wonderful caregiver and enjoyed helping others. In 1957 she married William Cloutier. Together they were blessed with four children and 33 years of marriage until his death in 1990. Karen was a member of Lebanon Lutheran Church. 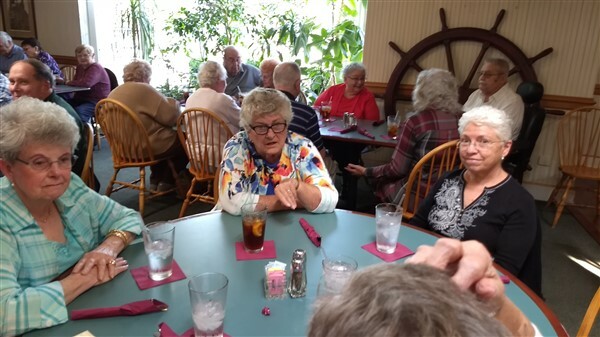 She enjoyed gardening, reading, music, and family gatherings at the Gaslite Lodge. The most important thing was always her family. She was a kind, funny, optimistic, passionate loving woman. She will be deeply missed. Karen is survived by her children, Susan (Orville) Crain, Craig (Susan) Cloutier, Diana (Craig) Schultz and William Cloutier Jr.; grandchildren, Joshua, Kyle, Alicia, Ryan, Kailey (Jon), Brandon (Angela), Jared, Jacob, Andrew (Anya) and John (Elizabeth); four great-grandchildren; sister, Sandra (Ken) Kolb; and brother, Donald (Paula) Johnson. She was preceded in death by her husband, William; her parents; and brothers, Philip, Warren, Tom, Dean and Jim Johnson. A memorial service will be conducted at 11 a.m. Saturday, Jan. 6, 2018 at Lebanon Lutheran Church, 1101 S. Mears Ave., Whitehall, Michigan. The family will greet friends one hour prior to the start of the service at the church and also Friday Jan. 5 from 4 to 7 p.m. at Beacon Cremation & Funeral Service — White Lake Chapel, 413 S. Mears Ave., Whitehall. 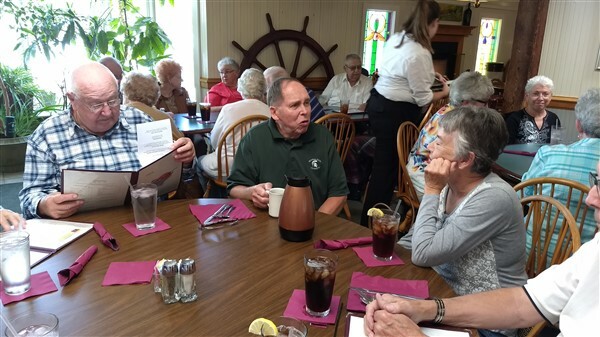 Memorial contributions can be made to the Harbor Hospice Foundation, Lebanon Lutheran Church or the Johnson Cancer Center. Beacon Cremation & Funeral Service is in charge of arrangements. http://www.beaconfh.com. 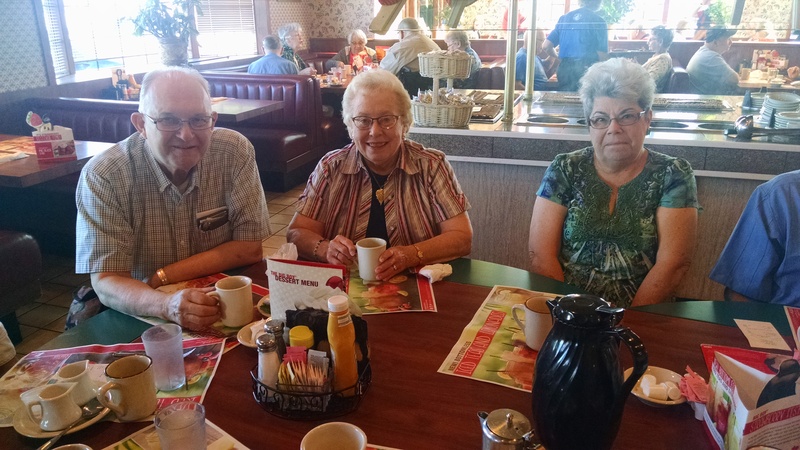 George married Kathryn Johnson in 1959 and they celebrated their 58th wedding anniversary Sept. 19, 2017. George worked his entire life as a cabinet maker for his father and mother who started Petersen’s Furniture Specialties in 1954. George and his brother purchased the business in 1982. In 1986, the business was partially destroyed by arson. 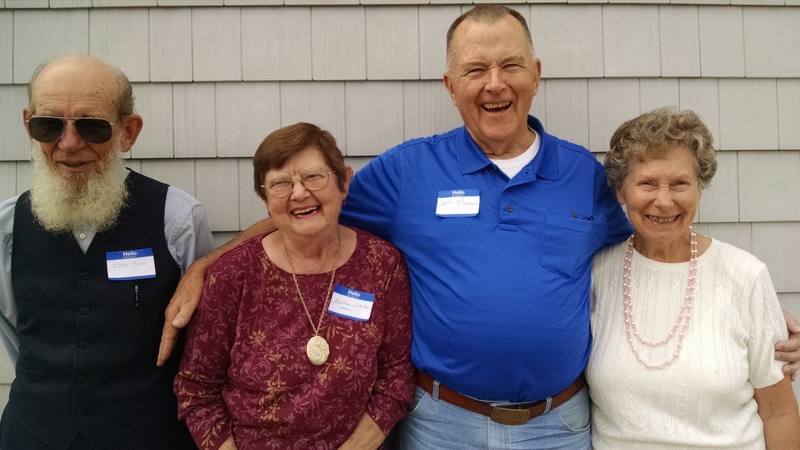 When George rebuilt the business he changed from designing and making kitchen cabinets and furniture to building furniture for handicapped children. He designed the furniture at the direction of a physical therapist who wanted to develop a line of furniture to assist very young children with physical handicaps — educational aids that would help them learn to stand, sit and walk. The business known as TheraDapt was the result of their vision. 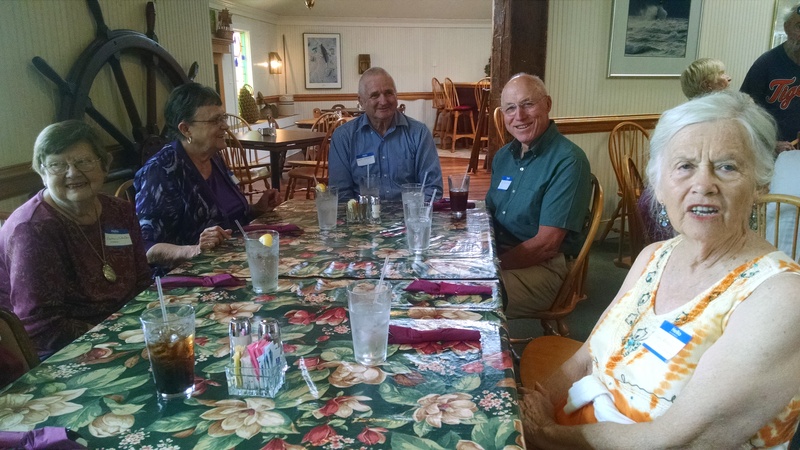 George was an Exhausted Rooster with the Ludington Jaycees. He was one of the designers of the Jaycee’s Mini Golf Course and built many of the original obstacles. 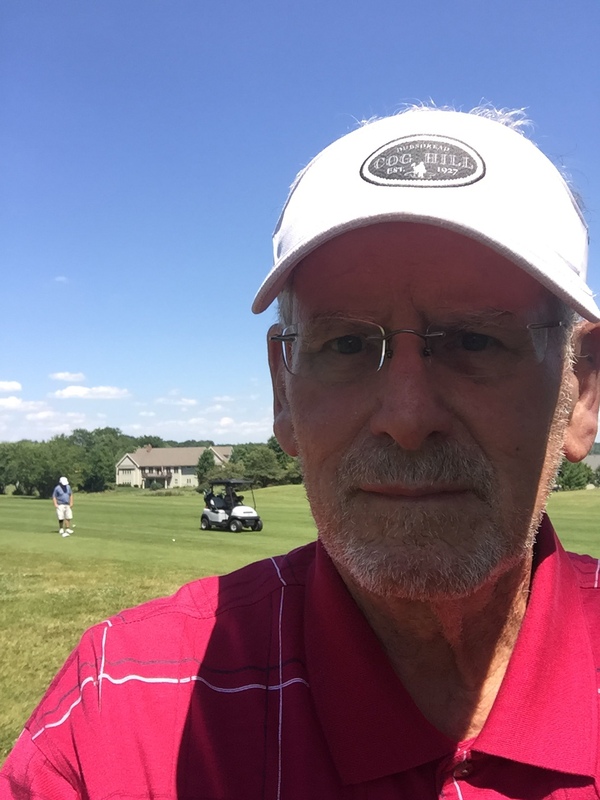 He was an avid golfer, hunter and fly fisherman. 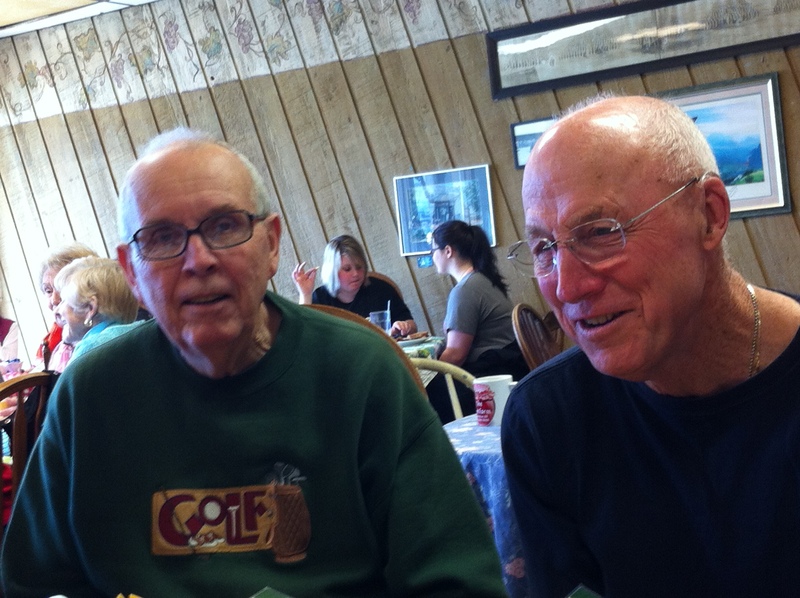 He was a member of Lincoln Hills Golf Club and the Ludington Elks and Eagles lodges. George loved Saint Bernard dogs and had nine during his lifetime. 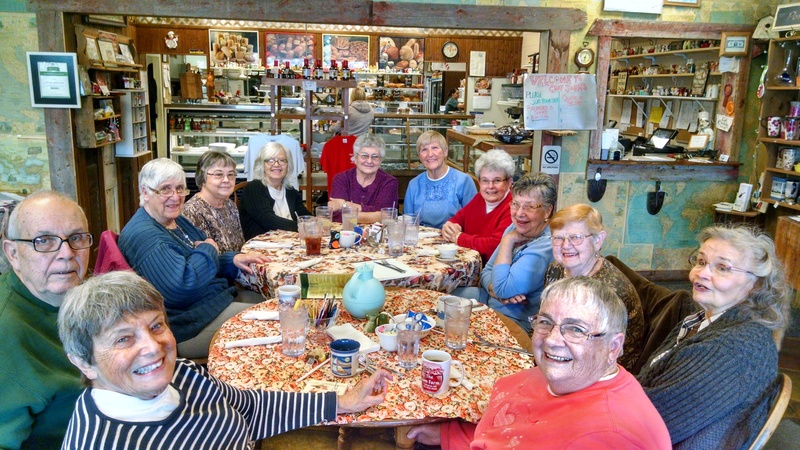 It was a lively Class of “56” breakfast meeting on Tuesday October 17, with 10 classmates and 1 guest sharing both old and new tales of life and living. We all left, when it was time to go, with smiles and happy faces. We’ll see you all next month, that is assuming the Michigan weather cooperates on the warm and sunny side. 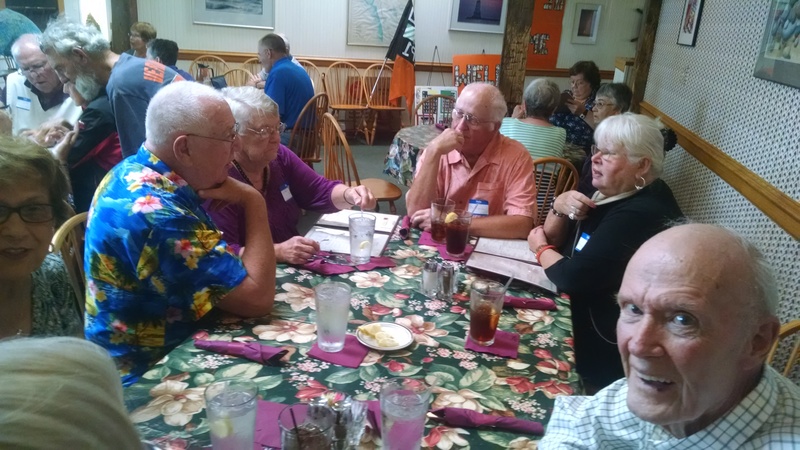 The 61st Reunion Lunch celebrating the LHS Class of 1956 was held on Friday September 8, 2017 at Scotty’s Restaurant in Ludington with 28 classmates attending. 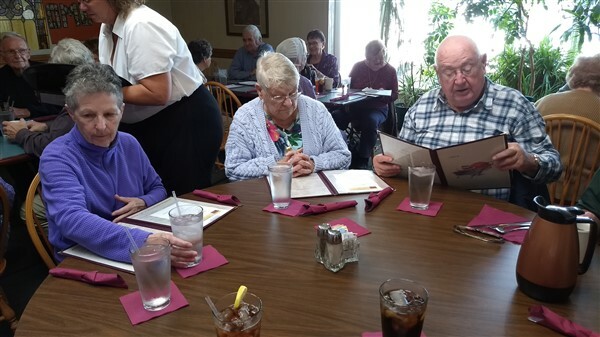 Here are some candid photos of our gang at lunch. Robert Lee Huber, age 80, of Ludington passed away Thursday, September 7, 2017. He was born July 26, 1937 in Ludington to William and Marcella (Michaud) Huber. 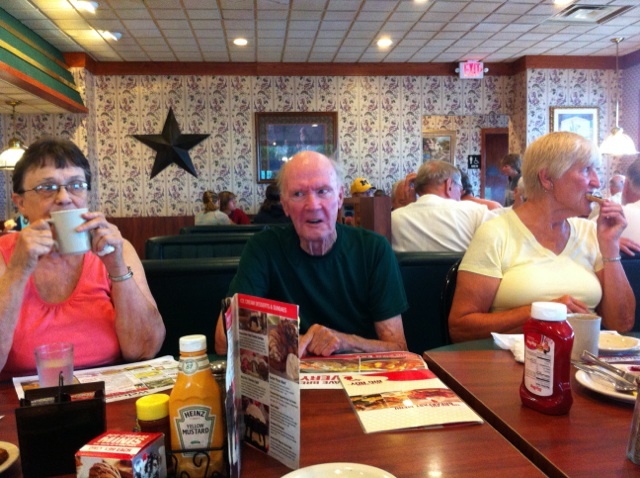 Bob graduated from Ludington High School in 1956 and enlisted in the US Army. He served his country in Germany as a Military Police Officer. On October 13, 1962, Bob married Rose Alice Winczewski in Ludington. Together they raised three children. Bob worked for Dow Chemical for 32 years as a Millwright, retiring in 1992. After retirement, Bob worked part time for Peterson Furniture where he did wood working for over 10 years. In his spare time, Bob enjoyed hunting, fishing, camping, gardening, and watching sports. He was a big fan of the Detroit Lions, Tigers, and Red Wings. He was a member of the American Legion and St. Simons Catholic Church. Bob was an amazing husband, father, and grandfather. He will be greatly missed by his beloved wife of 55 years, Rose; Children: Susan (Joseph) Caudill of Scottville, Julie (Bruce) Lowing of Ludington; daughter-in-law: Pam Huber of Ludington; five grandchildren: Stephanie (Sal) Virzi, Alexandra and Nicholas Lowing, Ethan and Haileigh Huber; sister-in-law, Evelyn Kokx, and numerous nieces and nephews. Besides his parents, Bob was preceded in death by his son, James Huber and his brother, Richard Huber. According to his wishes, cremation has taken place and a Celebration of Life service will be held at a later date. 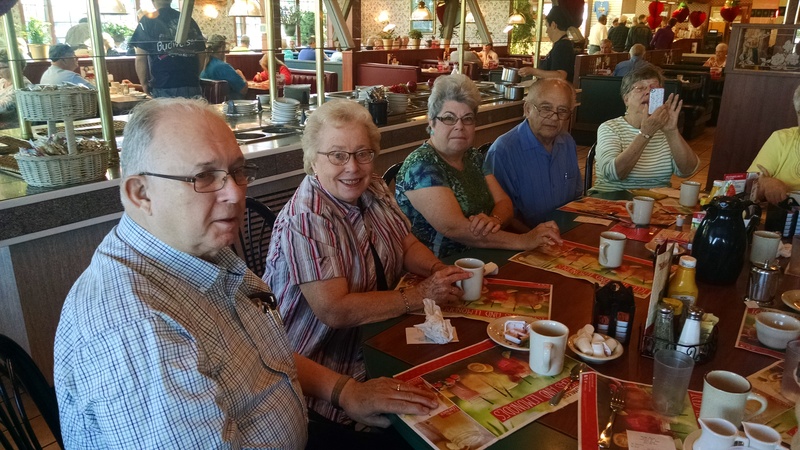 Below are some photos from the class breakfast at the Big Boy in Ludington on July 18, 2017. 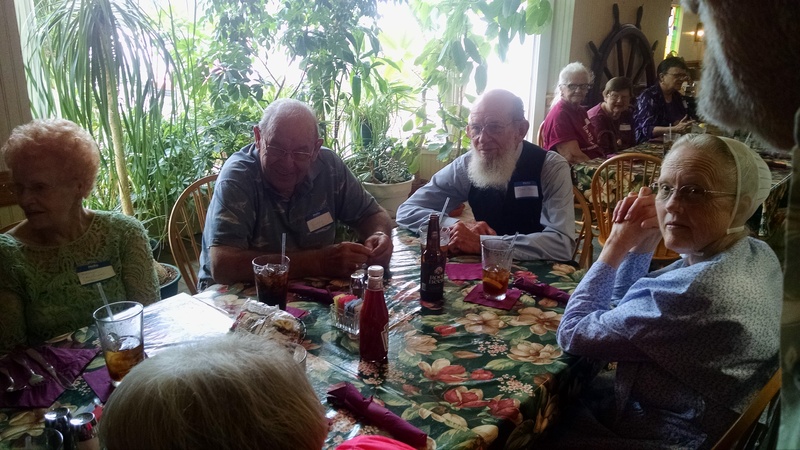 Always great to see and visit with some “old” classmates! It is with great sadness that we must report on three of our classmates that have passed away recently. James (Jim) Peter Johnson 6/28/1937 – 6/4/2017 , A “Victor Valiant…” Jim was an enthusiastic and loyal fan of University of Michigan football. But his family and friends knew that he was the real “conquering hero”. Jim used his grit, determination and optimism to battle many illnesses over the years. Each time he got back up to again live life fully. Yet Jim also knew when to admit defeat. “This is not a life,” he recently said. Jim died peacefully on June 4, 2017 to be with his Lord and Savior. “But thanks be to God! He gives us the Victory through our Lord Jesus Christ.” I Corinthians 15:57. Jim was born in Ludington, MI, the son of a loving and athletic Swedish family which included six brothers and four sisters. “Watch out for those Johnson boys,” was what coaches of opposing high school sports teams advised. Jim served in the Michigan National Guard. He retired from the General Motors Coopersville Plant. Jim was a proud and caring father and grandfather. His opportunities to travel enhanced his passion for history and politics. He loved to golf. While spending many winters in Florida, Jim learned the art of fused glass and created many beautiful pieces. 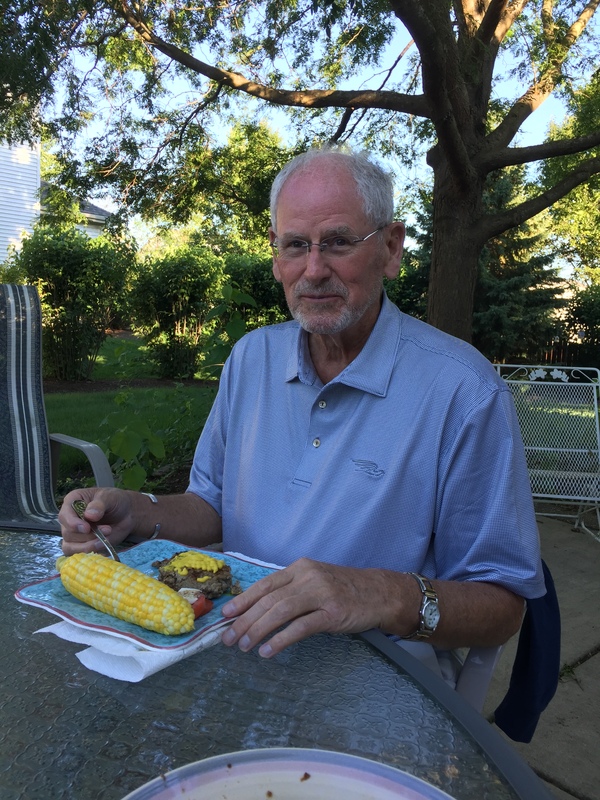 Although living many years in the Grand Rapids area, he moved to Grand Haven to again be near his beloved Lake Michigan and its memorable sunsets. Jim is lovingly remembered by his wife, Eunice; two sons Paul (Renee) and J. Peter (Jamie); four grandchildren, Ryann, Britt, Erik and Gage; one brother, Don (Paula) and two sisters Karen Cloutier and Sandra (Ken) Kolb; brothers- in- law John and James (Michelle) Thurman; and many nephews, nieces and cousins. He was preceded in death by his first wife Karen, the mother of his two sons; by four brothers, Philip, Dean, Tom and Warren, and two sisters, Phyllis and Alice. The memorial service for Jim will be at 11am on Saturday, July 15, 2017, at St. Luke’s Lutheran Church, 3215 4 Mile Rd NE, Grand Rapids, MI, with a visitation at 10am. Carole Jan Schierholt peacefully passed away on Sunday, November 6, 2016 at Spectrum Health of Ludington, with her family by her side. Carole was born on April 30, 1938 in Pontiac to the late Ernest and Ella (Smith) Engel. 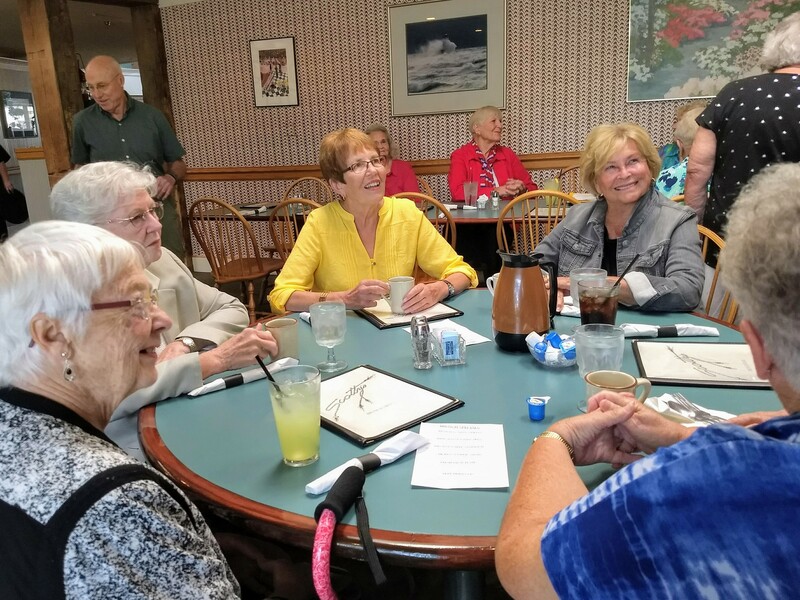 She attended Ludington High School and graduated with the class of 1956. 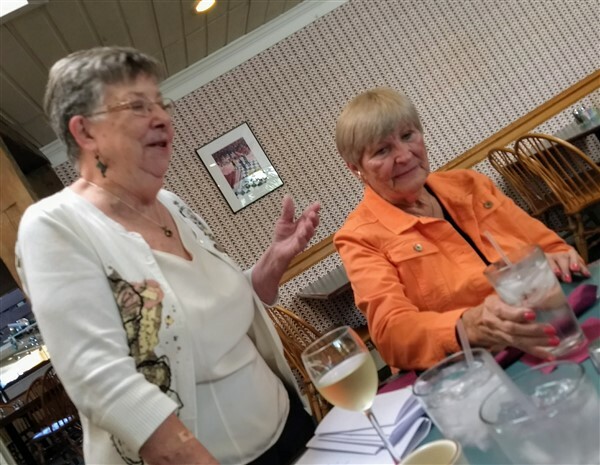 She graduated from Ferris State University, with a BA of Science Degree, in 1964. She married Donald Schierholt in Branch on July 18, 1982. Carole was a teacher for Ludington Area Schools for twenty nine years. She retired in June of 1993. 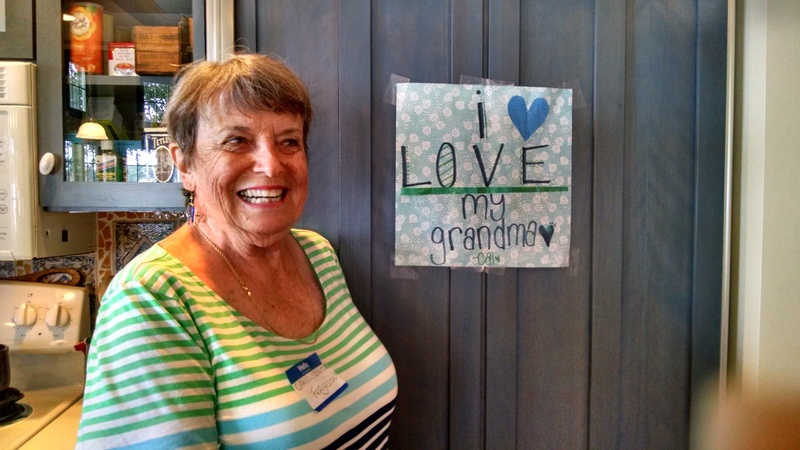 She had a huge passion for knitting, as well as the game of golf. 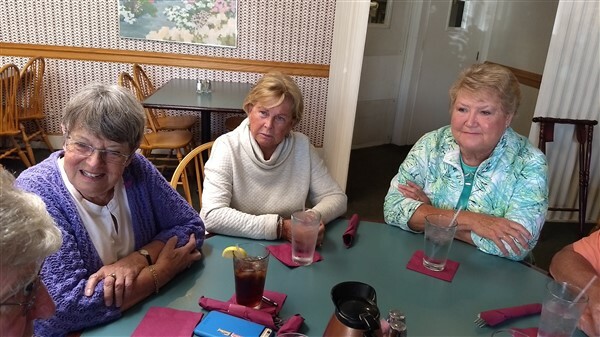 She was an active member of the Manistee National Golf Club, and Lincoln Hills Golf Club. 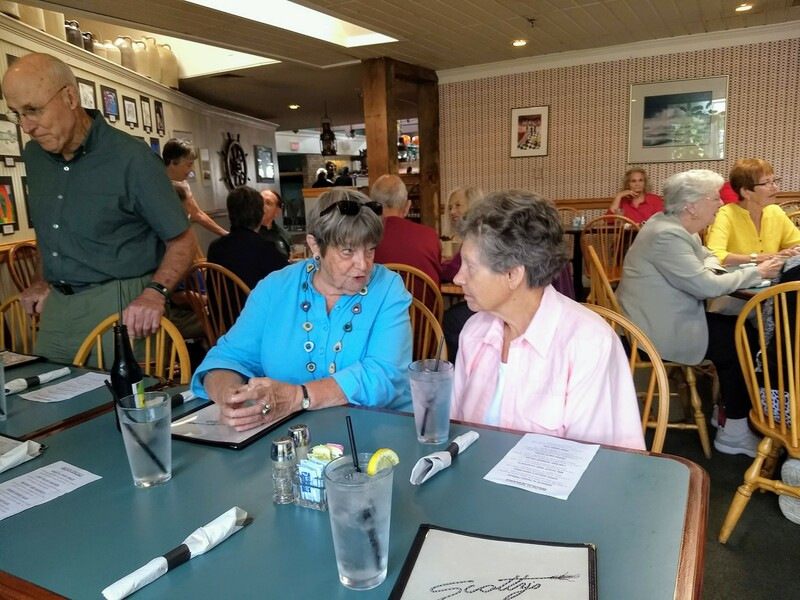 She served as the past president and secretary of the Women’s Western Golf Association. She was highly recognized as a high school and college gymnastics judge. 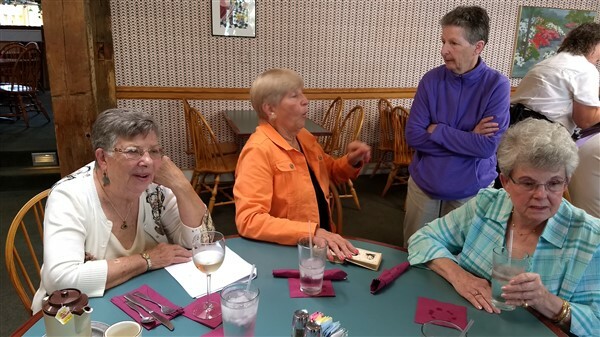 Her passion for golf was tendered by coaching the LHS girl’s golf team for twenty two years. Her love of golf provided her the opportunity to compete on multiple championship golf courses throughout the United States; Including, Hawaii, Florida and Arizona. Carole will be remembered most for her pure kindness, strength and passion for life. 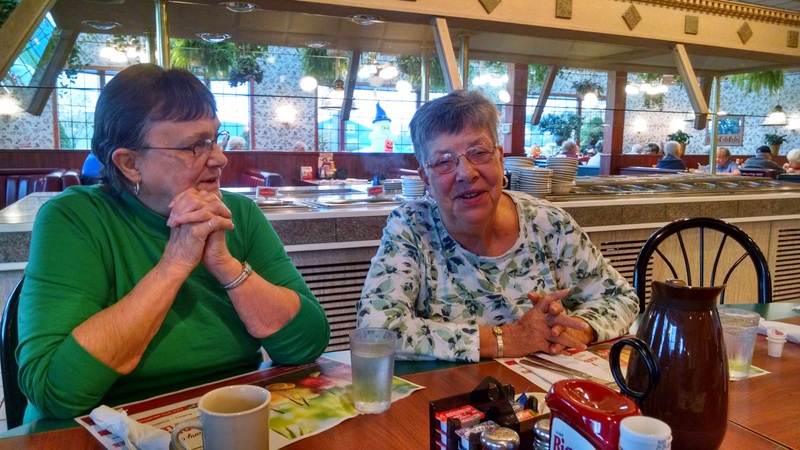 She is survived by her Loving Husband: Donald Schierholt, Brother: Ernest Fritz (Deloris) Engel; son: Randy (Renee) Hansen; daughters: Christina (Ed) Arnold, Nancy (Lou) Patterson, Beatta (Marc) Needham; granddaughters: Randi (Kevin) Sniegowski, Stephanie (Random) Messeder, Teri Arnold; grandsons: Jake (Erica) Irwin, John Arnold, Kyle (Megan) Hansen, Dylan Hansen, and numerous nephews and great grandchildren. She is preceded in death by her parents, and son SSGT Steven Mark Hansen. A life so beautifully lived deserves to be beautifully remembered. Please join Carole’s family at Lincoln Hills Golf Club, 1527 N. Lakeshore Drive in Ludington, on Saturday, June 24th 2017 to celebrate her amazing life. 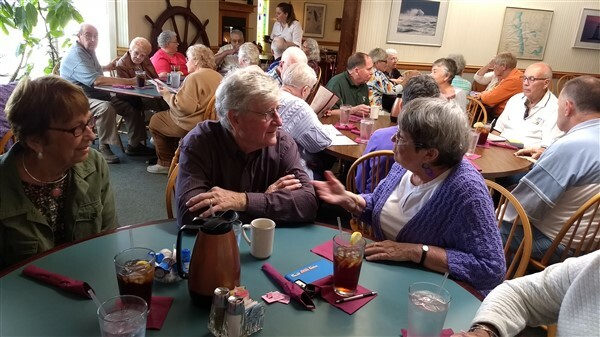 We will meet from 2-5 p.m. to share memories, stories, laughter and appetizers. Classmate Gary Wayne (Wikorejczak) Wickery, 78, of Ludington, passed away on Monday, March 27, 2017. Gary was born on August 13, 1938 in Ludington, son of Joseph and Viola (Case) Wickery. 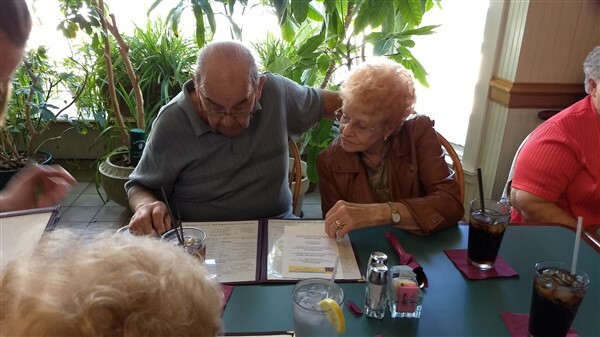 He graduated from Ludington High School in 1956 and married the love of his life, Judith Nickelsen, in 1959. Gary retired from Harbison-Walker Refractories in 2000 after 38 years of service as an instrument technician. 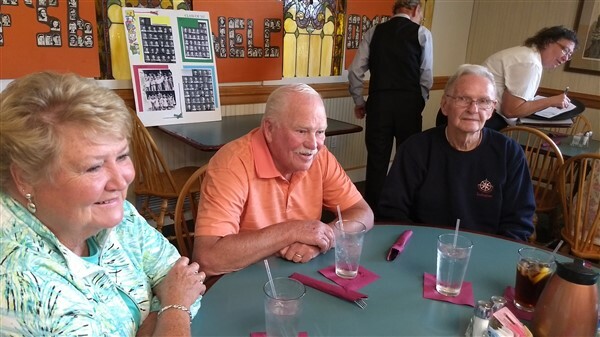 He and his wife, Jude, were long time members of Lincoln Hills Golf Club and Ludington Outboard Club. He enjoyed volunteering his time to the annual Fish Boil. He was also a member of Danish Brotherhood #51. After retirement, Gary could be found golfing, fishing or hunting with the guys. Gary and Jude raised their children and had an incredibly loving marriage. They enjoyed camping together and going to the casino. In 2003, Gary had a stroke and through his perseverance, was able to recover almost fully after three months. Although Gary could only golf with one arm after that, he was still a better golfer than Jude! Gary is survived by his wife, Judith; children, Ronald (Rachael) Wickery and Lyn Deshawne; grandchildren, Jason Wickery, Gary (Shanley) Deshawne, and Aaron (Christine) Deshawne; great grandchildren, Johnathon, Alex Marie, Aidynn and Rylan Deshawne; sister-in-law, Mary Wikarejczak; and brother-in-law, Meryln Davenport. Preceding Gary in death are his parents, Joseph and Viola; and siblings, David Wikarejczak and Lois Davenport. Classmate Luella Spaulding age 78, passed away on March 12, 2017. 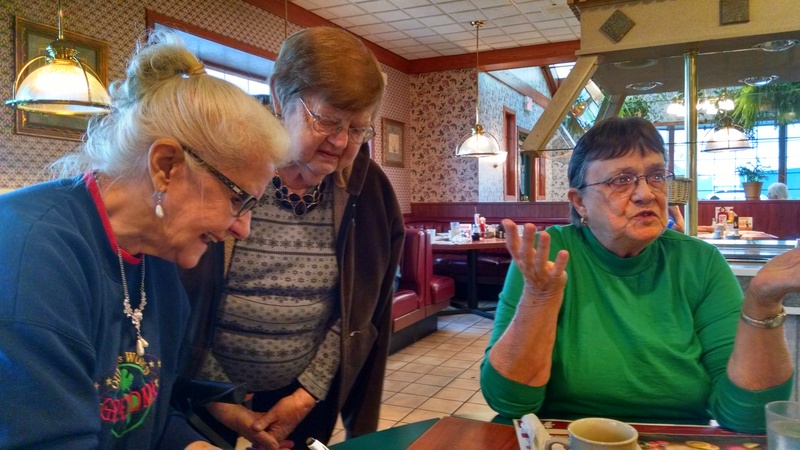 Luella did not have any known relatives that would provide details of her obituary. 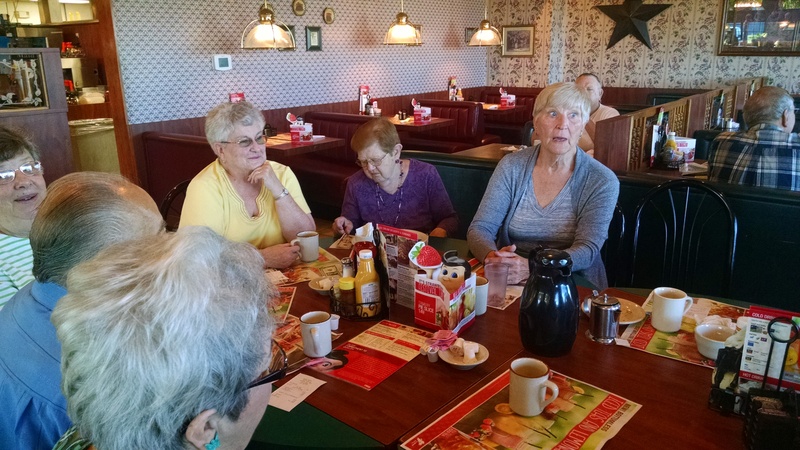 Photo’s from breakfast at the Big Boy in Ludington on Tuesday October 18, 2016. Click on the photo to get the big picture! It was a great fall day in West Michigan! 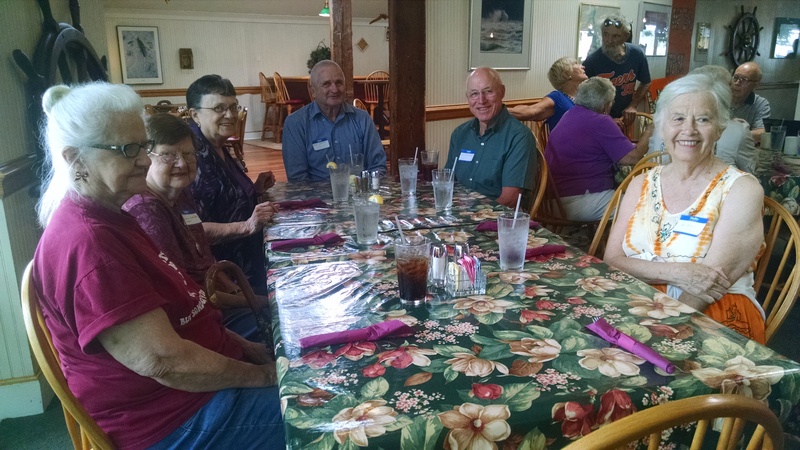 Some photo’s from our 60th Class Reunion on Friday, September 9, 2016, at Scotty’s Restaurant in Ludington. Moved recently or changed cellphone number or email address? Send a note via USPS or email to Jack Madsen with the updated information so we can contact you for class events. 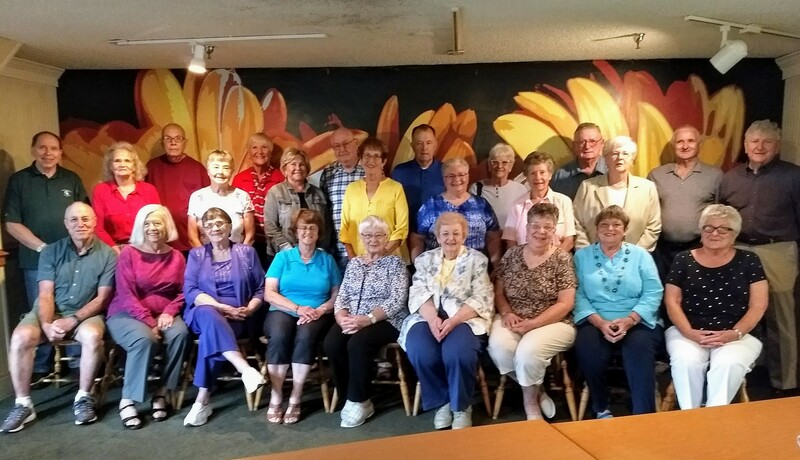 Dear LHS and St. Simon Class of “56”, it is time for our 60th get together! When: Friday, September 9, 2016, at 12 Noon. 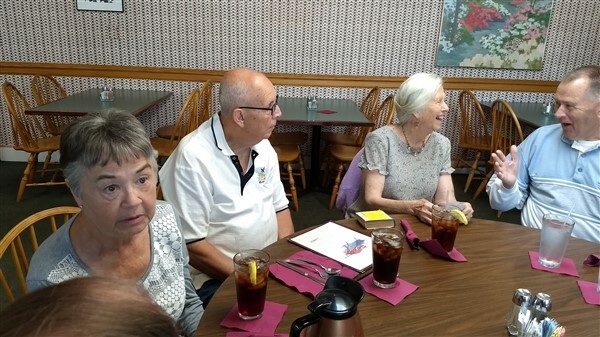 Where: Scotty’s restaurant in Ludington located at 5910 US-10, East Ludington Ave.
Then: On to Caryl’s at 2939 N. George Lane, Hamlin Township for an, after lunch, Bring Your Own Beverage and Finger Food meet and greet session. 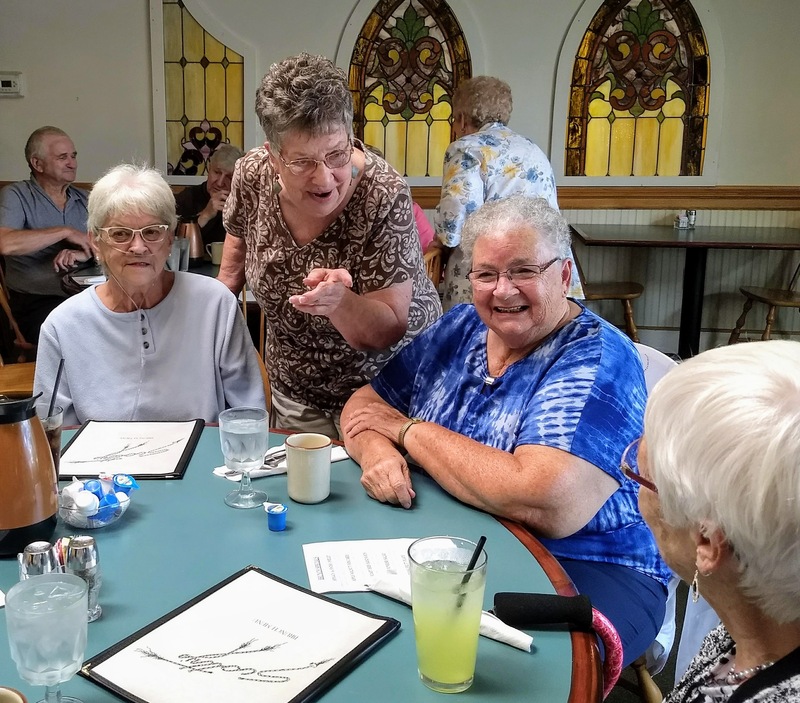 RSVP: To Jeanne or Janelle (Telephone, email, or USPS; 505 N. Lewis St. Ludington MI 49431) so they will know how many will be at Scotty’s for lunch and can reserve your seat(s). Note: We will order off the Scotty’s Menu and Pay Individually. To Commemorate this 60th Reunion, the class poets have composed the poem below for your enjoyment. Hey, we’re all about seventy-eight! And we’ll have to watch our weight! 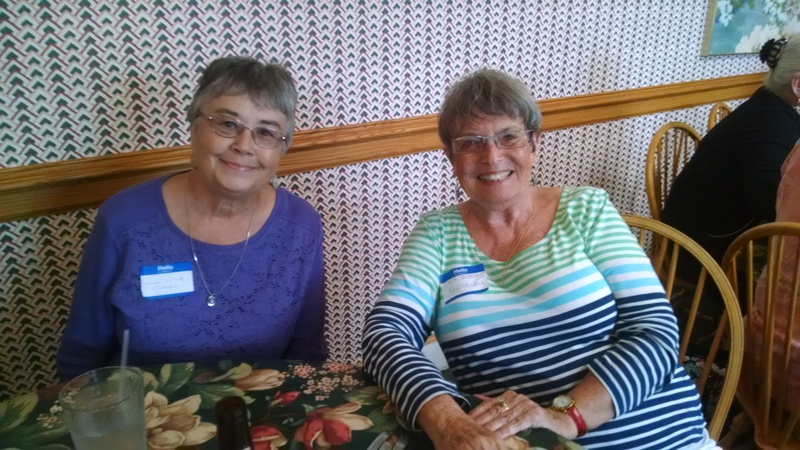 So hey, we’re about seventy-eight! Until it’s time to drive someone home. ‘Cause we all want to be seventy-nine! 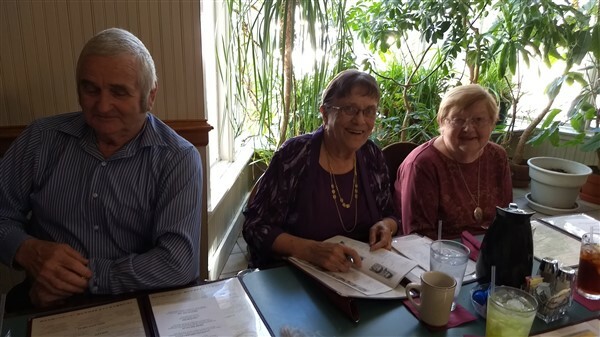 The photo above taken December 1, 2015 is the Class of 56 December monthly lunch with each month being at a different restaurant. 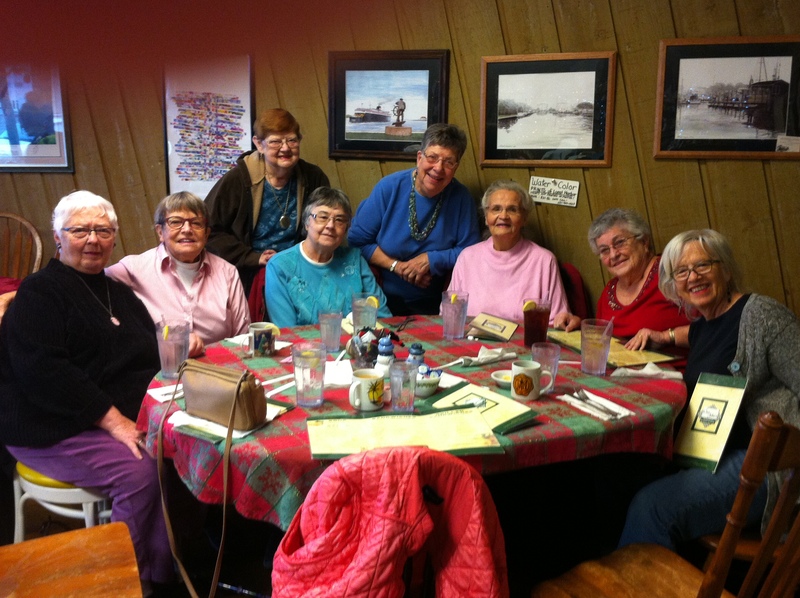 The gathering this month was done before so many of us take off to warmer climates for the winter. This is a point in our lives when our children come to get us, as is the case for two of us, as they don’t think we can make the trip without escorts! Foolish kids! 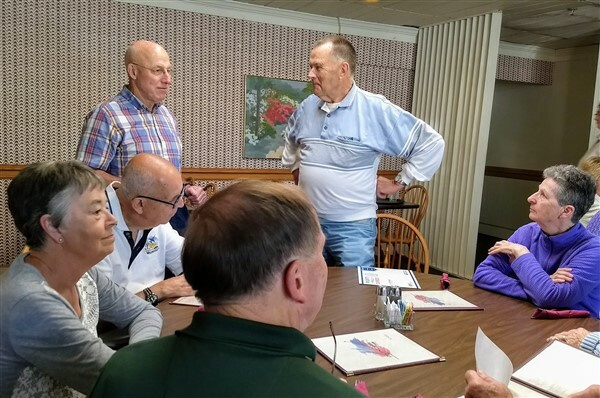 The October Big Boy meeting in Ludington was sparsely attended to say the least. But we all had a good chat over breakfast. Lots of classmates traveling or visiting this month. It’s a good fall time to see the leaves turning colors and the earth getting ready for a Michigan winter. Maybe we will see more of you in November. 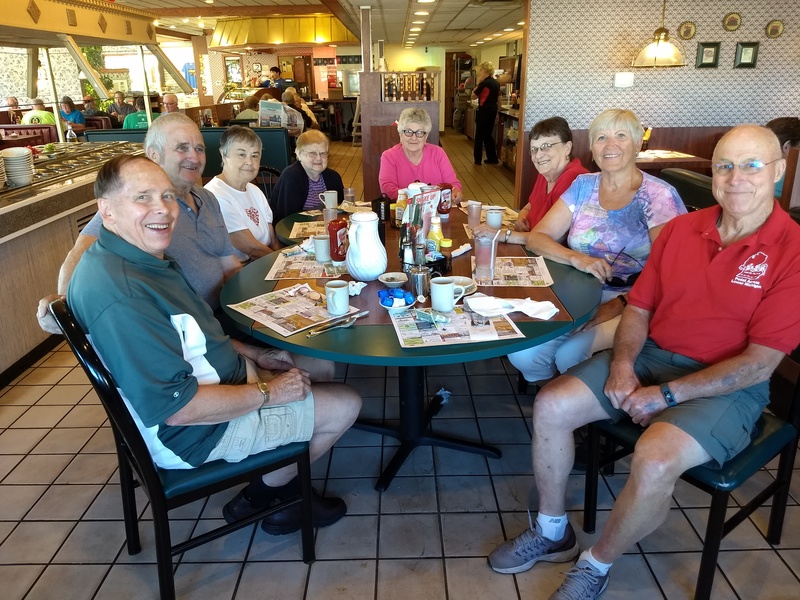 A very small gang met at the Big Boy in Ludington on September 15 because some people didn’t realize the third Tuesday in September was the 15th, not the 22nd of the month. Fall is upon us with winter not for behind. Let us hope for an El Nino influenced winter that will bring sun and fun to Ludington in January and February 2016. 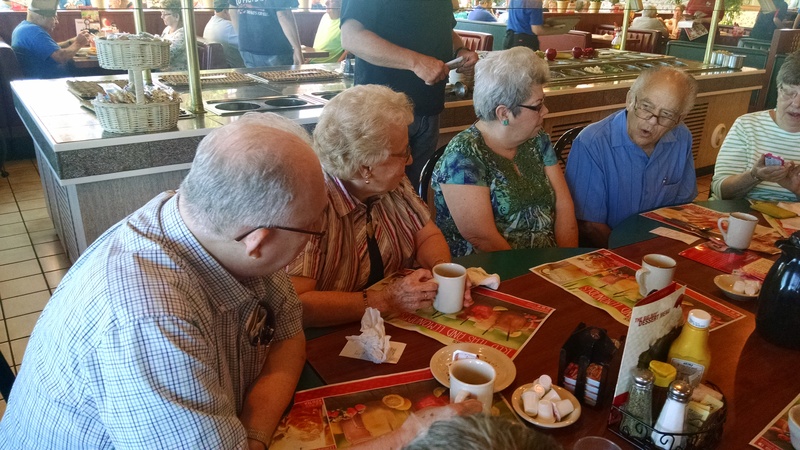 Below are some photos from the August 18, 2015 breakfast gang at the Big Boy in Ludington. 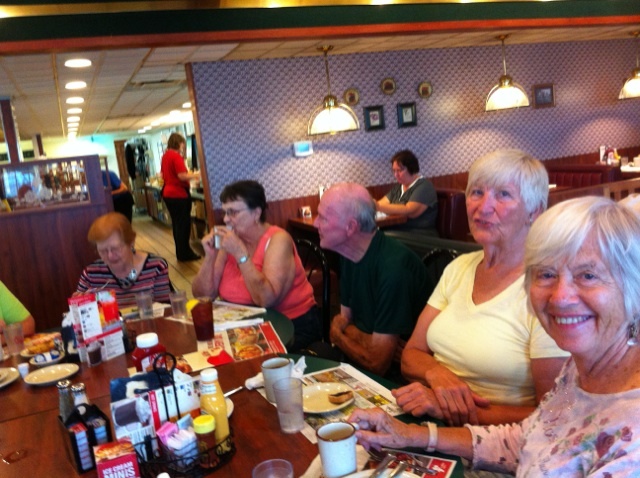 The July 21 Big Boy breakfast in Ludington was it’s usual good time with lots of gab among the cozy crowd of 7. 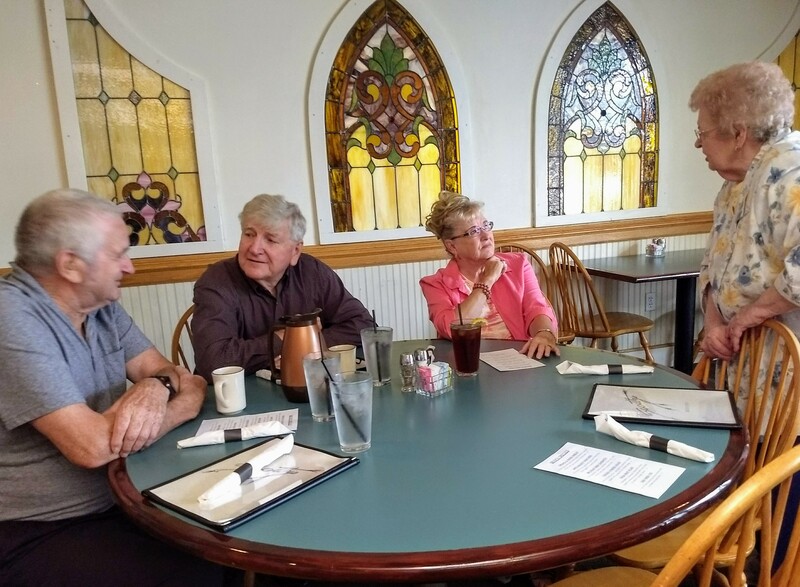 Summer in Ludington is one great time to sample the beach, eat at the eateries and receive visitors from far and near. Mr. Lester Earl Hillier, age 77, of Montague, passed away Thursday, June 18, 2015. He was born May 26, 1938, in Burt, MI to Perry and Ada (Durham) Hillier. Lester graduated from Ludington High School and served in the United States Army during the Vietnam War. 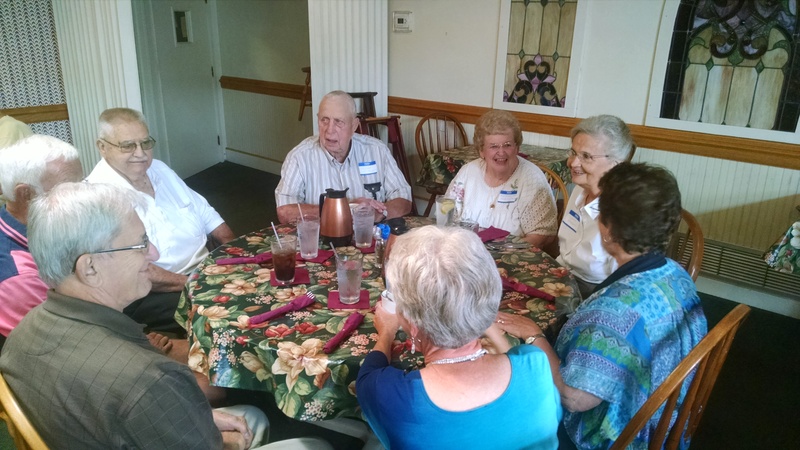 On June 20, 1964, Lester married Marjorie Snyder in Hart; they were married fifty years. He was employed at Howmet as a set-up machinist where he worked for thirty-five years. 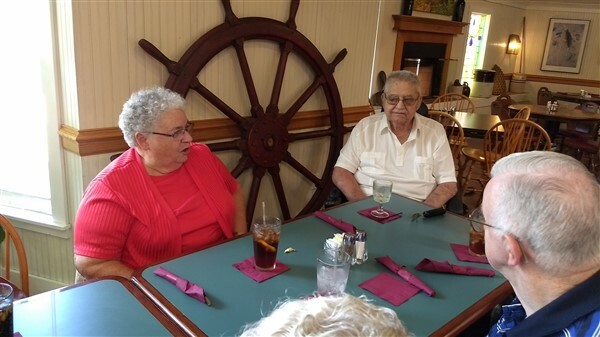 Lester enjoyed classic cars, country music, sitting on the porch, and bird watching; he also had a wonderful sense of humor too. 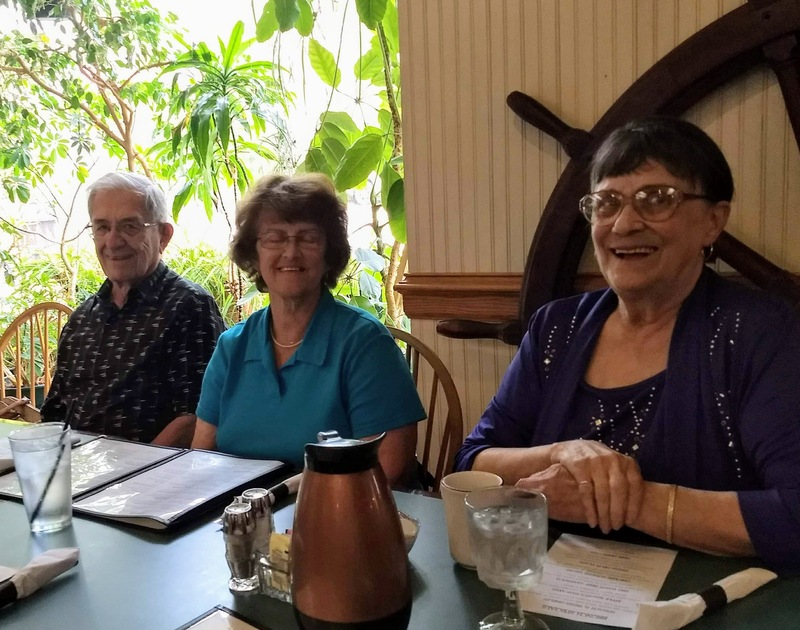 Lester is survived by his wife, Marjorie Hillier of Montague; one son, Lester (Trish) Hillier of Montague; one sister, Norrine Hendrickson of OK and one brother, LaVern Hillier of FL. He was preceded in death by his parents; two sisters, Betty Mead and Joyce Darling; and two brothers, Virgil Hillier, and Russell Hillier. 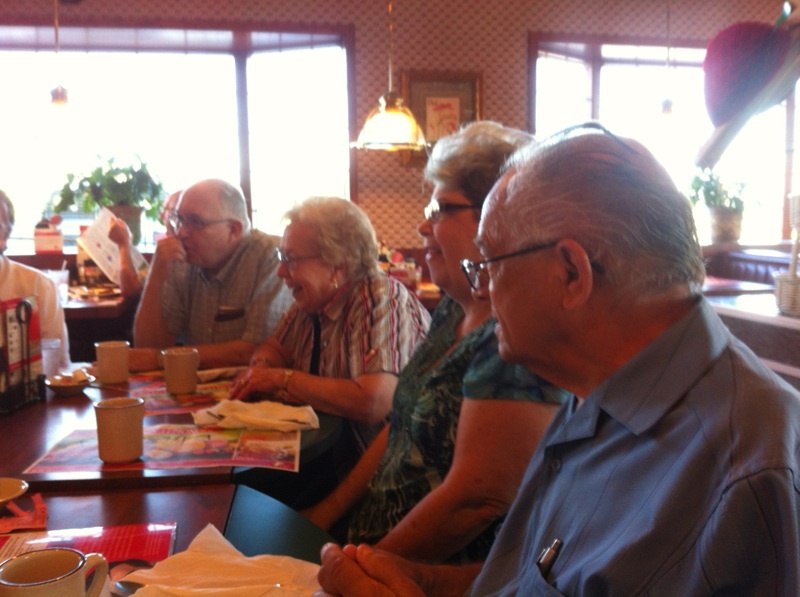 Some photos of the June 16 breakfast at the Big Boy in Ludington. Our website is back. I mean our own, custom crafted, Ludington High School class of 1956 website. It was gone from the web for many months because its software was verging on extinction—which hypothetically, existentially, could have been our fate as well. It’s actually quite unusual, even now, for a high school class to create its own website. It’s rare indeed for a class as old as ours to build a site and then to rebuild it when old software falters. So again, give thanks to Vic. I don’t pretend to know how he did it, and I can’t imagine what sustained him through the long, confounding process of redoing it. I can only guess that Vic is driven beyond motivations that the rest of us will never comprehend. I used to look at the old website now and then just because I was stirred by old, abiding memories. In later years, the website gradually took a more somber turn as old classmates died off, but I still felt compelled to keep informed. On the bright side, I saw that our class looked to be surviving uncommonly well, so far having a notably low mortality rate . 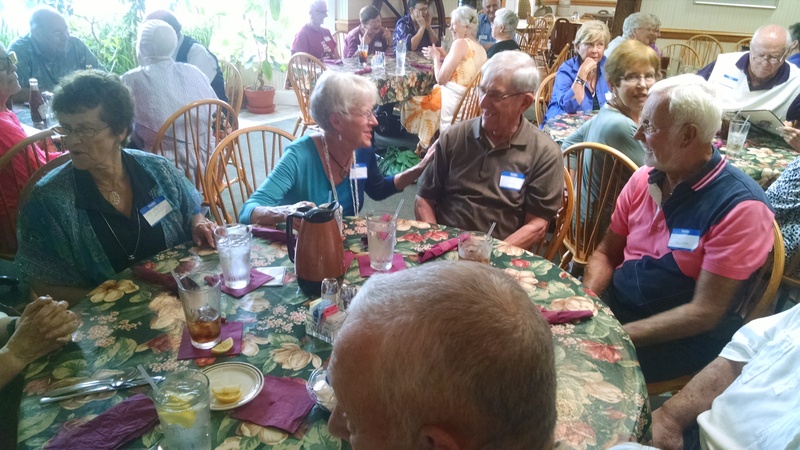 This gives me hope for a 100th reunion—a stupendous gathering of redoubtable 117-year-olds. Our resuscitated website will have an obligation to fill in the events that occurred during the many months offline. Frankly I don’t have much to report for that period: I’ve just settled into a quiet routine. I still write, though I no longer try to make a living at it. I build curious things, like floating docks, and reinvented doghouses and dollhouses. The only reunion I attended was the 45th, and since then I’ve wed for the second time, acquired two grandsons, and traveled quite a lot. I’ve returned to Ludington only on occasion, mostly for weddings and funerals. I live in a very nice house in Chicago, with a wife, dog, and two cats. My health is good enough that I’m hopeful of making the 100th reunion. So yet again, many thanks to Vic Jackson. And how about the rest of you telling of events during the time of website dormancy–and sharing your wisdom on faring as senior citizens? 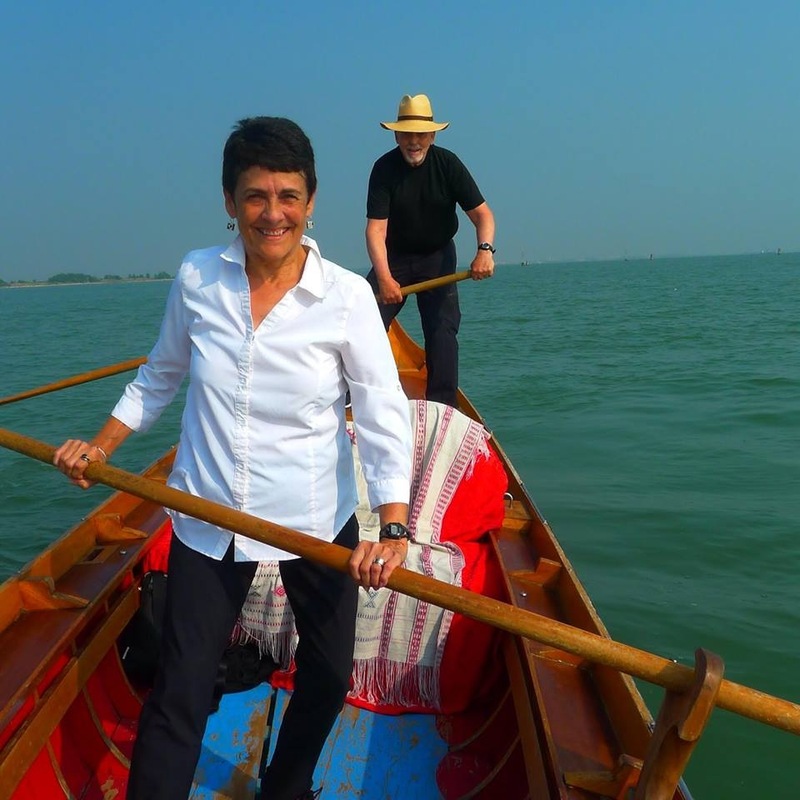 Above: Tom Hall and his wife Diane Graham-Henry learning to row a gondola in Venice. 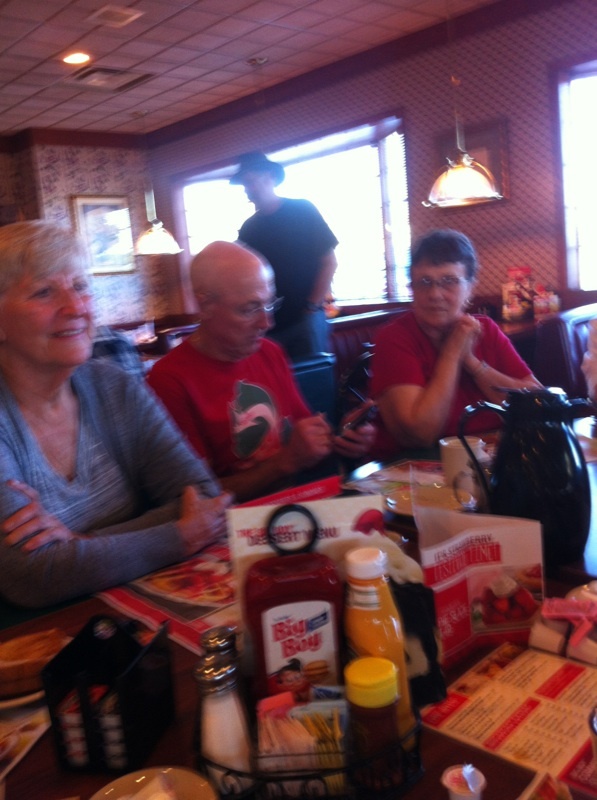 From the April 4, 2013 breakfast at the Big Boy.